Menu coming together – or is it? Choices, choices. I thought I had fixed the menu in my head but today when I went out shopping there were so many yummy things that caught my eye; plump pigeon breasts, home-cured rollmops at Bluey’s, wonderful looking duck at Barkaways. So will it be rabbit terrine to start, or perhaps duck rillettes? On the other hand a warm pigeon salad has never been known to fail to please and how about a salad Liegoise with waxy new potatoes and slices of those great looking pickled herrings? 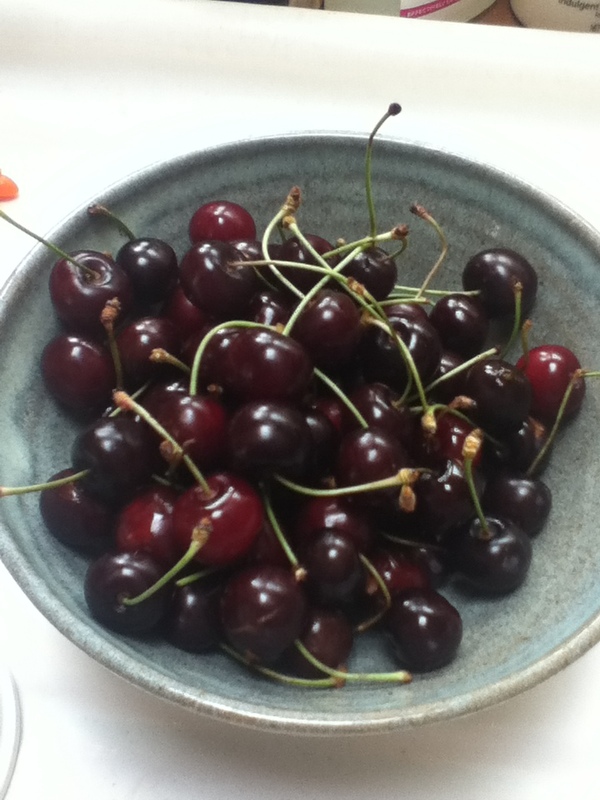 Excitingly the first of the cherries have appeared. There is a wonderful character “Terry”, who you can find just off the Whitstable road coming out of Faversham – there a signs which lead you into a field along a bumpy track, through an apple orchard and then deep into the shade of vast old cherry trees. Somewhere in the canopy, up one those wonderful ancient tapering ladders, you can often spy a man and a bucket and then at ground level, amongst the trees a small stall with “sound horn for attention” and “Terry’s Cherries”. At £2.50 per pound despite the terrible harvest this year, first the late frosts, then the wind and endless rain, this is a labour of love because it surely can’t be a money spinner! So there will be cherries in there too for sure. I am thinking about a twist on the Spanish classic churros with hot chocolate so maybe they can sit alongside to cut through the richness. Lots of choices and the main course to figure out, but you can be assured I will have fun tasting and testing for you. Great chat with Rob from The Farmhouse in Canterbury and it looks like I may well be doing a little demo slot in the cooking tent at Lounge on the Farm. Crikey! So a slice of #emwilcosupperclub, in half an hour, in a tent, at a festival. Who would have seen that on the cards 3 months ago? I realise that I still haven’t written up the last one properly, and I will, but in the meantime I have been asked several times if there will be another….and happily there will on Saturday 21st July. Once again I will be at Macknade in their wonderful cafe and the produce will be locally sourced and seasonal, although it is hard to tell which season we are currently in – “Flaming June” anyone? So as you can tell there’s work to be done on slimming down the choices – I’m not sure I’m ready for a nine course tasting menu! One or two people have asked if I could offer vegetarian options and whilst I would love to accommodate different dietary needs, the supper club premise is to offer a set menu and keep it simple. I am though more than happy to put on an event entirely celebrating vegetables if there would be enough takers, so do let me know via the contact page if you would be interested. Meanwhile it’s on with the planning and an anti-rain dance might be useful.